Overlord’s 11th episode, called “The Bloody Valkyrie,” raised as many questions for me as it answered. The episode started with Ainz teleporting to Shalltear’s vicinity with Aura and Mare. 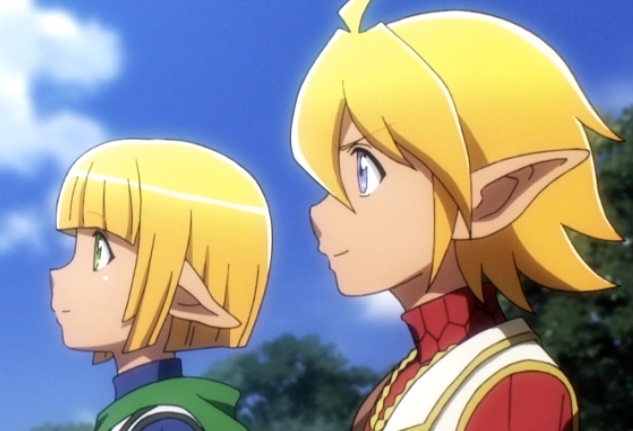 Ainz immediately ordered the brother and sister to scout the area for enemies. Since they both carried world-level items, he gave them strict orders to retreat if attacked — the items were worth more than their lives (“…depending on the situation,” Ainz said). Mare and Aura seemed eager to help Ainz, despite the enormity of the task before them. Capture from Funimation’s stream. Plus, more importantly, their retreat was part of his plan. Failure to follow his orders could throw his goals into disarray. As Ainz prepared to confront Shalltear, he had to admit that he still didn’t know what was going on — or who was behind it. Back at the Great Tomb of Nazarick, Albedo and Cocytus are engaged in an increasingly tense argument with Demiurge. 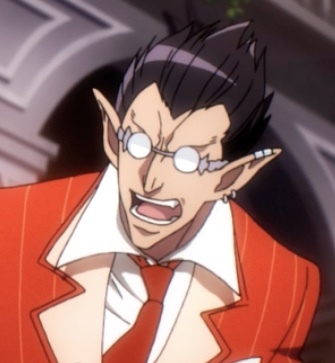 Demiurge was not happy that the other two, especially Albedo, allowed Ainz to fight alone. Capture from the Funimation stream. It’s troubling because it goes directly to the question, “Is this still a game? A new kind of reality? Some combination, or even something completely different?” And what effect did their loyalty have on Ainz? How could someone who was, until the event in the first episode, just a gamer, fulfill the expectations of the Floor Guardians of the Great Tomb of Nazarick? Would the responsibility crush him? Further, how could he find out who was behind that attack Shalltear’s attack? When all was said and done, Ainz loved his creations so much that he couldn’t bear to see them fight among each other. So he took on Shalltear alone. Capture from the Funimation stream. As he prepared to confront Shalltear, Ainz revealed the real reason he couldn’t allow Albedo or his other Floor Guardians to fight Shalltear: he just couldn’t bear to watch them fight each other. I got this. I’ve played Role Playing Games (RPGs) since the very first Dungeons & Dragons set came out. 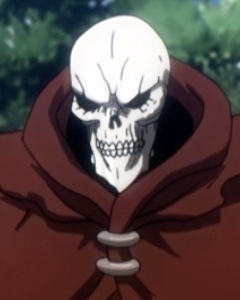 Ainz (or Momonga as he was known in the “real” world) created many of these characters. His friends created the other characters. Together, they created the Great Tomb of Nazarick. Seeing it come under fire from any assailant would be hard to take. But not even knowing where the attack was coming from? That would be doubly difficult to accept. Everything I’ve described happened in the first eight minutes of the episode. From this point, the style of battle between Shalltear and Ainz did not resolve the question of whether or not this was real or still a game. Just as in the game, Shalltear could not initiate an attack against Ainz; he had to strike first. Ainz used spells typical of the game to prepare for battle — was that an indication that we’re still in a game, or a reflection of their new reality? Within the battle, they discuss MP (magic points) and HP (hit points). Was that an indication they were in a game, or a reflection on how they perceived the new reality? They took turns attacking and defending. Was this a natural flow of combat, or part of the turn-taking combat system in the game? Unfortunately, Shalltear’s reaction to Ainz’ first attack didn’t clarify matters. “Who is your master now?” he asked. The battle explodes at this point. Each takes turns — again, as part of a game structure? or as an organic give and take of a new reality? — until they stand, both diminished in MP and HP, in the sands created by their devastation of their battle. 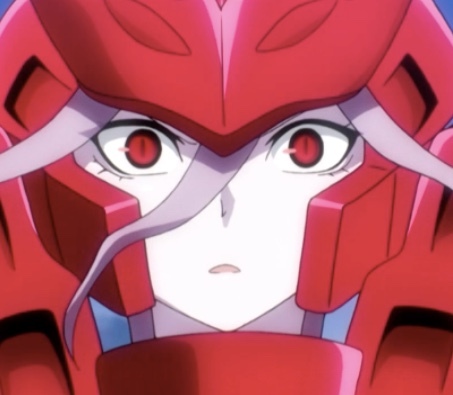 Shalltear, confident in her victory, was surprised by Ainz’ confidence at the end. Capture from Funimation’s stream. And so the episode ended. Is this world real? Is it still just a “game?” Who pitted Shalltear against Ainz, and why? These questions are critical, and yet there’s only one (known) episode left. After 12 episode, I have confidence in Overlord’s writers. I have confidence that they will tie things up adequately, or provide an appropriate spring board to a second season. To be honest, given the massive promise I see in this series, if they don’t, I will be profoundly disappointed.